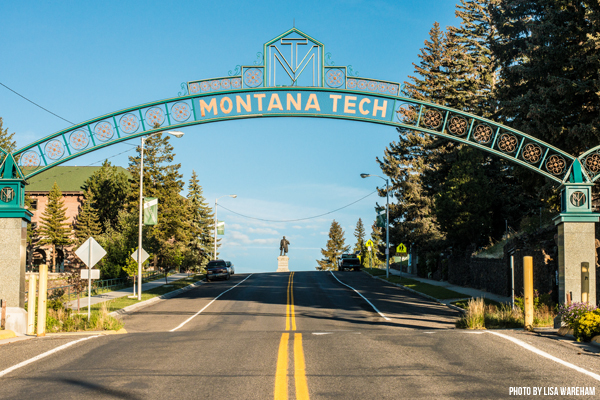 For more information on parking at Montana Tech, contact the Physical Plant at (406) 496-4268 or e-mail mdurkin@mtech.edu. Please direct any questions about parking to the Physical Plant Office at 406-496-4268. Parking permits are required to park on campus. These are hanging permits so if you have more than one vehicle that you drive you only have to purchase one permit and just make sure it is hanging in the vehicle you are driving onto campus. The parking permits are for one person only not to be shared. Do not loan your permit to your friends or partners. You are responsible for any tickets received on your parking permit. The parking lots are designated with signs to tell you what permit is required. This is for all paved and unpaved lots. There is no place on the Tech campus you can park without a permit (see the attached detailed parking maps). Tickets will be issued for no permit, parking in a lot other than the one on your permit, parking in a loading and or fire zone, no parking zones which are designated by diagonal stripes. Permit designations are “A” faculty and staff: “B” off campus students: “D” resident hall students. All yellow curbs and hatched areas are “NO PARKING” at any time. Turning on your flasher does not make it legal to park in a no parking zone. All handicapped areas are Handicap Permit parking only. If you have a handicapped permit, you are required to purchase a MT Tech parking permit and both are to be displayed. The hatched areas next to the handicap parking spaces are also handicap spaces and the fine for parking there is $100.00. If there are no handicapped parking spaces available, you may park in any of the Visitor parking spots. If you have a 30 day or less injury you may pick up a handicap form in the Physical Plant Office to be filled out by your doctor. We will issue you a temporary handicap permit. There are rows of “A” permit only located on the North end of the Library lot, see attached map. The first section on the first Tier to the stairs is also “A” permit only. Once you are past the stairs on both sides of the row it is “B” parking. There are designated motorcycle parking spaces. This is for motorcycle parking only, motorcycles are not permitted to park in any other to parking spaces. Students, Faculty, and Staff are not allowed to park in the visitor parking for any reason. The visitor parking is for people coming to visit the campus. There are 20- minute parking spots in front of the Mining and Geology Building for those who have to drop things off at the Enrollment Services or Business Office. If you are there longer than twenty minutes, you will receive a ticket. If your permit is lost or stolen, notify the Physical Plant Office immediately for a replacement. If you are in possession of permit that has been reported lost or stolen, you may lose parking privileges on campus for up to one year. Alteration or duplication of a parking permit shall result in a fine and/or revocation of parking privileges for up to one academic year. You may file an appeal for parking tickets you believe you received unfairly. The appeal must be filed within 30 days from the date of the ticket. If you receive more than three tickets, your vehicle may be booted and will not released until your fines are paid. The same applies if the vehicle you are driving is not registered to you, or you have out of state plates. You can purchase your parking permit online by going to MY MTECH on the Tech Web Page. Sign in and then go to “Important Links”, scroll down and click on parking decal. Follow the directions when filling out the online form. We accept cash and checks for payment in the office. For credit/debit card payments, you will have to pay online; print out your receipt with your permit number on it and bring it to the Physical Plant Office to pick up your parking permit. If you purchase your permit online prior to the beginning of school and would like it mailed to you please email me a copy of your receipt requesting the permit be mailed and where you would like it sent. Remember you can avoid long lines if you pay online. If you are a third party pay such as Voc. Rehab, you will need to go to the Business Office for a receipt to bring to the Physical Plant Office before you can pick up your permit. Parking permits are issued to one person only. You cannot share your permit with your roommate, significant other, and/or friends. The hatched areas next to the handicap parking spaces are for wheelchair access only. These are not additional parking spaces. Should you park in one of these spots you will be issued a fine of $100.00. The City Bus does not charge anyone with a current Tech ID card to ride the bus. The bus arrives on Park Street in front of the SUB on the half hour and out at the Highlands College on the hour. You can get the Bus routes on http://buttebus.org. With construction of the new Student Success Center (eastside of the HPER Building), there will be some parking lot reassignments, and closures, see attached map. If you have questions regarding parking, please contact the Physical Plant Office at 406-496-4268.